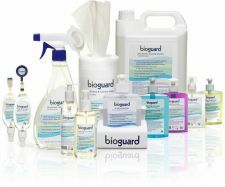 To assist users in the easy application and use of our products during their cleaning regimes we supply a range of JANITORIAL PRODUCTS that can be used across a whole spectrum of machines. A RANGE OF BRUSHES — As different machines require different sizes of brushes to clean pipes and components, a range of brushes is provided. PAPER TOWEL — A two ply towel enables users to use dry off cleaned components prior to putting them back into the machines. CLOTH ROLL — Our heavy duty material specification for our jay cloth ensures that our product does not easily tear or degrade when used on sharp and difficult shaped components and machine parts and can be used during route cleaning. GLOVES — We provide gloves in three sizes to meet individuals requirements, these protect users hands when machine cleaning. BIN BAGS — To fit most machine waste bins. During regular cleaning and hygiene regime cleaning and in workshops. As necessary in our products user instructions and in accordance with machine manufacturers instructions.